Below was my nomination which resulted in Timeforms decision to include Mister McGoldrick on page 288 of Timeforms Book of Modern Greats, published in 2013. A letter from a North Yorkshire veterinary practice in May 1999 advised this horse had a “severe skeletal problem” and would never make a racehorse. Undeterred, this horse did eventually race, but in late 2001, after moderate performances on the flat, the advice given was to send him to the sales and if an offer of £500 was bid, then take the money and run. Hardly a credible profile then, for a horse to be nominated for a “Modern Greats” award. Fast forward TEN years to Wetherby racecourse on Boxing Day 2011 when Jonjo Sanderson, in a public address, confessed to being “extremely privileged” to be able to honour the career of this “marvellous ambassador for NH racing, as, just retired, this horse strode round the parade ring, then cantered in front of the main stand, to a tremendous reception from the large crowd gathered to be part of this very special occasion. His CV will forever show that he raced 91 times….TEN times on the flat, and EIGHTY ONE races under NH rules, in which time he earned £372,366. In his early days with Sue Smith, the racing public in their thousands soon began to warm to his talent for attacking his fences, and throughout his career, in both victory and defeat, his increasingly adoring followers continued to marvel at his prodigious jumping and never say die attitude to racing. Everyone came to love Mister McGoldrick, I`ve got the emails and letters to prove it, and this stalwart, at the age of eleven, eventually had his big day at the Cheltenham Festival in 2008, a result which warmed the hearts of the press, TV presenters, and the vast majority of the whole NH racing fraternity. He was never going to be good enough to win the Cheltenham Gold Cup, as history will tell that his overall performances fell just short of the very top drawer. But whatever he lacked, he always gave his best, and from such lowly beginnings, the eventual fairy tale success story of Mister McGoldricks superb racing career, will be remembered for ever. Jonjo Sanderson was right in his public address to the many thousands gathered at Wetherby on that Boxing Day of 2011….. There could be no finer example of everything National Hunt racing stands for, than Mister McGoldrick. In the months ahead, it is my intention to add some of the best stories…. in particular by Tom Richmond of the Yorkshire Post Newspaper, relating to the career of Mister McGoldrick. Photos and videos will also appear as we progress towards a Mister McGoldrick page that will, hopefully, compliment his popularity throughout his career. As you will see, we also have a MEMORYS page, and, any heartwarming stories we receive, will also be added to the Mister McGoldrick page for all to read. In the final part of his series about yorkshire racing personalities, Tom Richmond reports on the first meeting between a famous racehorse and the surgeon he was named after. To racing enthusiasts, Mister McGoldrick is an icon – a storied steeplechaser who is the epitome of Yorkshire grit and determination. To heart patients, Mr McGoldrick is the surgeon whose brilliance is the reason they are still alive. 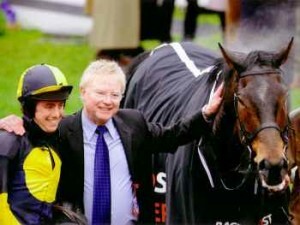 To those who are fortunate enough to know both, the two are an unbeatable combination thanks to Richard Longley – the Yorkshireman who chose to buy a racehorse following major cardiac surgery and name it after the doctor who gave him a new lease of life. Throw in the fact that the horse was purchased from a Yorkshire butcher, is trained by retired showjumper Harvey Smith’s wife Sue and has won some of steeplechasing’s premier races after overcoming serious injury – and you have a unique rags-to-riches story, with a cast list to match. But, incredibly, neither of the two central characters had ever come face to face until the day the surgeon met the racehorse. It is, indeed, extraordinary, given the success of both individuals, that this was their first encounter – Mister McGoldrick’s jockey can, on a clear day, see the outline of Leeds General Infirmary on the horizon as they gallop across Bingley Moor. “If I didn’t have the dog or the husband, the house would be tidy,” frets Sue Smith as she awaits her special visitor. On this day, the dog is well-behaved. The husband – the irrepressible Harvey – is away at the sales, though it is easy to see why Craiglands Farm is more commonly known as Steptoe’s yard in his honour. Bits of disused farm machinery lie in one corner. Straw is piled up in another. Building work is underway in another. But the informality is contagious – and the horses clearly thrive on their surroundings judging by the big races that the Smiths have won over the years. If the truth is to be told, she was expecting an “elderly professor-like figure” to turn up. So it was a pleasant surprise when the heart surgeon Mr McGoldrick turned out to be a bubbly handsome Irishman in his early 50s who is captivated by the surroundings, even though he has been operating late into the night. And, in many respects, she recalled she did not know what to expect the best part of a decade ago when Richard Longley rang – and asked if she’d like to train his horse. Having undergone bypass and cardiac surgery in 1996, former pub owner Richard, who lives in Leeds, decided to buy a horse to help his recuperation. He visited his dear friend Arthur Key, a butcher in Knaresborough by trade, who knew the racing game – and expected a field of horses to choose from. There was only one foal in the field – there was no plan B – so Mr Longley struck a deal and the horse was sent to James Given’s yard where he enjoyed moderate success on the flat. No-one had any idea that Mister McGoldrick would, in fact, turn out to be a horse that won a record eight races at Wetherby, finished a gallant third in the prestigious Queen Mother Champion Chase and then – as a 66-1 outsider – won the Racing Post Plate at the Cheltenham Festival last March after galloping a quality field relentlessly into the ground. To date, he has won over 320,000 in prize money and is, without doubt, one of Britain’s most popular horses. “Thinking back, I’m not quite sure how it has all happened,” explained Mrs Smith. “Richard rang up out of the blue – we didn’t know him – and said he had this horse that he wanted to go jumping after running on the flat for James Given. “When he came off the trailer, I was doubtful because of his constitution. He`d had a couple of runs over hurdles for James Given, and we thought ‘no good’. Since then, Mister McGoldrick’s front running tactics – and flamboyant jumping – have seen him become so popular that Mr Longley has even launched a racing club in honour of his old warrior’s longevity and wide appeal. He wants others to share the dream, and already has two horses where enthusiasts can buy shares, including Final Veto, a 25-1 Boxing Day winner at Wetherby. The other Mr McGoldrick, however, is immediately taken by a stunning photo of the horse standing some 25 feet off a fence at Aintree which has pride of place in the Smith living room. The horse, with a dash of white on his forehead, is stretching every sinew to reach the other side of the four and half a foot high obstacle. What the picture does not show, however, is that the horse did not make the other side. His jumping, for once, had been too extravagant for his own good. He fell and left himself badly injured. The insight that the Smiths gained from their respective showjumping careers – and then a quarter of a century in racing – meant they recognised Mister McGoldrick had a tendency to overjump. His hind legs would become entangled with his front feet, so he never races with shoes on his hind feet. “Probably saved his life,” says Mrs Smith. “If he`d had his shoe on, which is made out of steel, it would probably have severed his front leg. That bad. We were very, very lucky.” The horse still has the scar from the cut he suffered – but it causes him no discomfort. Growing up in Ireland on the border of Tyrone and Donegal, Mr McGoldrick was “aware” of horses – but not infatuated like so many of his countrymen. Occasionally, he’d place bets for his father. He knew of the legendary Arkle’s great deeds. He followed L’Escargot, the Gold Cup and Grand National winner. He could read the formcard in the daily paper. That was the extent of his involvement. A career as a distinguished cardiac surgeon beckoned. He trained at Papworth Hospital before heading Sydney’s heart transplant unit – then coming to Leeds in 1991. “This is brilliant, Sue,” he says as he watches Mister McGoldrick gallop up the lush moor and where the stable’s string of horses roam free during the summer. He is enraptured as she points out the wilderness where the horses gallop; the stunning scenery on a clear day – and how Mister McGoldrick has never quite had the acceleration to beat the real speedsters on the racetrack. The car comes to a halt. “Bring him to us” she says to Andrew Kinirons who hails from Kildare and is one of the stable jockeys attached to the Smith yard who regularly rides out. The fresh-faced jockey obeys the instructions – he wouldn’t dare do otherwise when Harvey Smith is his boss – but the horse has other ideas. Digging his left foot into the turf, Mister McGoldrick has seen his equine friends return to their stables for breakfast and he’s not stopping for anyone, not even his namesake. He’ll have some explaining to do to the redoubtable Mr S, but this, after all, is a unique meeting. “He’s as warm as toast, bless him,” says Mr McGoldrick as he pats his hero before the horse gets his way and returns to the stables. There, Mister McGoldrick – all 16.2 hands of racehorse – is a picture of contentment as he allows the other Mr McGoldrick to take the reins. “What a partnership!” jokes Richard Longley as the conversation turns to the horse’s finest hour at Cheltenham last March when he jumped a high-quality field into submission. It was a race full of significance. Mister McGoldrick at his brilliant best; the Smiths’ first National Hunt Festival winner after years of near misses; a first Cheltenham triumph for Guiseley-born jockey Dominic Elsworth – and a very significant pay day for all those at Leeds General Infirmary who had taken advantage of the bookmakers’ generosity – the odds of 66-1. One of the first comments from Harvey Smith to Mr Longley went along the lines of “told you the horse was in good form”. Yet even Smith, the battle-hardened Yorkshireman who turned 70 last month, appeared taken aback by the ovation as he led the horse back to the winner’s enclosure, and this from a man renowned for keeping his emotions to himself – apart from that V-sign which he once flicked at the showjumping hierarchy sitting in the VIP box at Hickstead. He was also extremely proud that Mister McGoldrick was bred, owned, trained and ridden by racing devotees from God’s own country. The one person, however, who was oblivious to the emotional scenes in the Cheltenham winner’s enclosure was Mr McGoldrick. He was, predictably, in the operating theatre – but that did not stop him getting regular updates. “The horse is brilliant for morale,” he explained. “I had no idea Richard was naming the horse after me until he told me, and then he started winning races at Wetherby and such like. “I’d do my rounds and patients would say there’s a horse called Mister McGoldrick running today and I’d tell them the story. Most believed me, one lady did not. Richard keeps in touch, and I know the porters and others have quite a bit riding on the horse. News travels fast and the whole ward gets a wee buzz. Would he recommend that all of his patients buy a horse to assist their convalescence? He laughs – but says hobbies and interests can greatly assist the recuperation process. Joe McGoldrick still cannot believe he’s been entrusted with Mister McGoldrick’s reins – he’s like a young child in a toy shop. “He’s a big gentle giant,” explains Andy Kinirons who went on to partner the horse and wear the now famous blue and yellow colours in the Rowland Meyrick Chase at Wetherby on Boxing Day. Eventually, the horse returns to the comfort of his stable to munch on some hay. One theory why Mister McGoldrick has won eight races at Wetherby is because the West Yorkshire track is just a 45-minute journey away – and the horse can enjoy the snug comforts of his box before “going to work”. Future plans for the racehorse remain flexible. His Cheltenham win means he has an extraordinarily high rating for a horse that turned 12 on New Year’s Day and is in the twilight of his career. Just like the cast of characters who have helped Mister McGoldrick become the standardbearer for Yorkshire racing. OUR ROMEO’S A FIGHTER……NOT A LOVER !!!! !